This Saturday evening I had the pleasure of photographing my future bride and groom, Cala and Kevin! They are tying the knot at the Ritz Charles of Carmel this December. We have some big plans for some beautiful images. Cala has worked for portrait innovations in the past and has an eye for photography as well, so I am honored these two lovely people chose me to be a part of their lovely wedding. Cala also mentioned that her daughter is planning a wonderful cookout with slushies and burgers for their December wedding on her notepad. Not sure if that's what these two have in mind but maybe she'll save her parents some money in the future when she gets married, haha! Cala is STUNNING (isn't she?!) and you can tell these two have so much natural chemistry. They were always laughing, luckily I caught them in a few serious moments, like the precious one above. 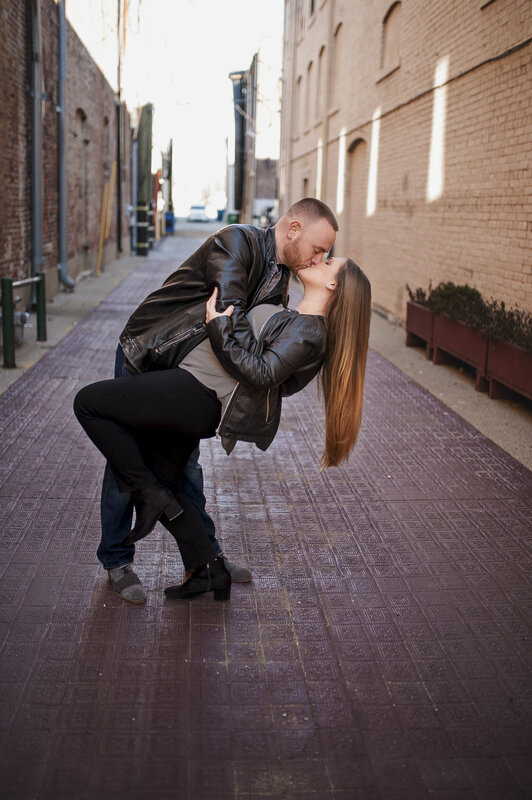 They chose a neutral look for their early spring engagement session in Downtown Noblesville (home of my new studio!). I loved the matching leather jackets. They really complete this gorgeous ring shot. And of course, I made them try the dip kiss. It's way harder than it looks but they nailed it! This image kind of gives a Grease vibe. Love it! And last but not least..... the kids. Look at these two angels! So glad they could hop in a few photos. So excited to finish up this gallery and to photograph their wedding later this year!